Signature Conference & Awards: National Philanthropy Day! We host the longest running & largest training conference and awards recognition ceremony dedicated to advancing philanthropy in Hawaii. 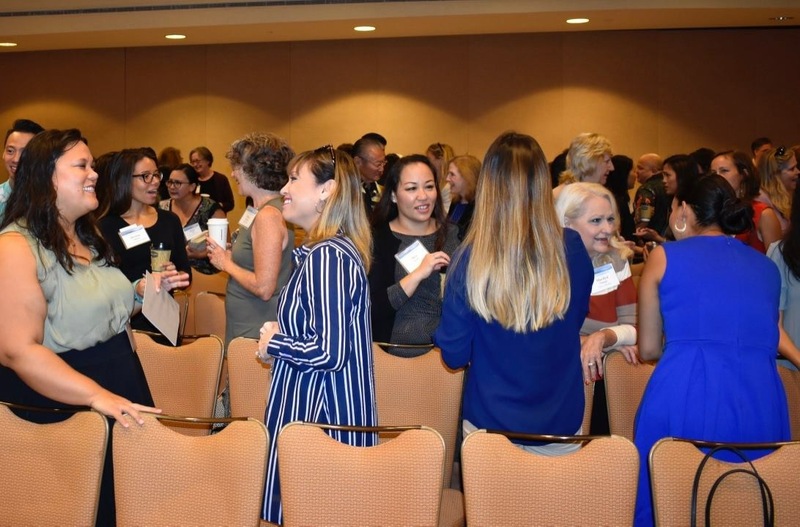 Instead of sending staff to costly mainland venues, AFP Aloha Chapter invites key experts to Hawaii as well as inviting local professionals in a specific skill area to share what they are learning in the process to advance philanthropy. Learn more! Educational offerings are structured around three tracks: 1) New Fundraisers, 2) Career & Certification Bound Fundraisers, and 3) Executive Level Fundraisers Each track provides a foundational pathway of knowledge and networking at the phase of fundraising they are in. Learn from peers in our communities or via webinars with National experts. Learn more about Aloha Chapter Education & upcoming offerings! The Aloha Chapter has a long relationship with the most prestigious and effective nonprofit organizations in Hawaii for over 30 years. Our members share their experiences and skills which develop local talent, confirm standards of practice, and offer assistance when it counts. Leadership on chapter committees reflects that high standards of behavior and comraderie in volunteerism that is necessary for professional fund development at any organization. The Aloha Chapter offers a volunteer opportunity that is meaningful and fulfilling. The Member Resource Center provides thousands of templates, videos, and associates to enhance current skills in their process to manage and maintain projects. Most all leadership & volunteer activities meet the credential expectations for point building to qualify for taking the CFRE test. Our chapter is excited to offer all neighbor island members web & teleconferencing access to see materials and hear presentations in live and replay formats. Volunteer committee members are offered the technology and facilitator setup services to host inter-island planning meetings and sessions between colleagues. Contact the chapter offices or signup on the session RSVP form to attend! We aspire to serve professionals that advance philanthropy! Achieving the Certified Fundraising Executive (CFRE) credential is the professional pathway & framework used by the chapter to serve members as they manage a self guided or a cohort driven approach to professional fundraising knowledge, ethics, and leadership service & development. 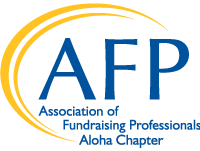 The Aloha Chapter hosts on ongoing admission of CFRE bound candidates and conducts the CFRE Review Course Series & Fundraising Fundamentals Course to serve organizations and individuals in their pursuit of performance improvement. Career Development or Improvment can be expensive and who has the time in a 80 hour fundraising focused week? Experienced members know that coveted scholarships and stipends make the difference for the professional who is points away from finishing a CFRE application, incentivize the motivation to take the challenging test, or needing new insights from the AFP international conference, and in many cases insuring his or her staff attends a Hawaii conference when training budgets are tight. Want to find a colleague? Interested in who is leading a new fabulous fundraising campaign? Desire a skilled speaker for your next event? The Aloha Chapter insures members have colleagues and experts contact information at their finger tips. For a quick peek at our list visit the Online Membership Directory!